I am so excited to release our first How to video! Learning sight words is an essential part of learning to read. For visual kids, drills and memorization can be difficult. So, I have a simple way to practice those sight words that will appeal to your visual kid’s right brain by using color to trigger their memory. Our first video shows you exactly how to implement this strategy. 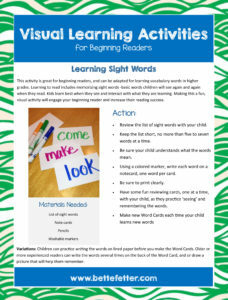 So watch it to see how easy it can be to practice sight words. We even have a worksheet for your reference, just click it to download! We have a couple more How to videos coming up in the next few weeks so keep checking our blog and YouTube channel for new ones. Unlock Your Child’s Hidden Potential	STOP the Struggle!